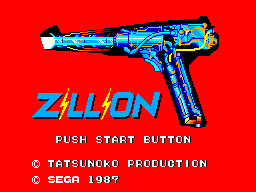 Zillion, known as Akai Koudan Zillion (赤い光弾 ジリオン) in Japan, is an action platform game published by Sega for the Sega Master System. It is based upon the Zillion anime series, and was released as a companion to the anime only a few weeks into the series' original run. However, the impression that the anime series had left with Sega and its teams would appear to go beyond just a video game. In 1986, Sega unveiled a redesigned, futuristic console in preparation for its entry to the North American market. Now known as, simply, The Sega Master System, the full units came equipped with the iconic Light Phaser. The overall design of the Light Phaser is a close copy to the fictional weapons used by the heroic The White Nights of Zillion. A sequel, Zillion II: The Tri Formation, was released the same year and also developed by Tatsunoko Production.